The GPS Wing is in the middle of a yearlong process designed to sort out the trade-offs among a set of at least nine options that may be undertaken to reduce the effects of a signal anomaly on the GPS satellite known as SVN49. In a March 26 teleconference, the first of two scheduled to discuss the options, Lt. Col. James Lake, the wing’s deputy chief engineer, emphasized that some of the options could well improve the performance of some receivers while decreasing that of others. He underlined the Air Force’s concern that receivers that don’t conform to the specification for GPS space segment/navigation user interfaces (IS-GPS-200) "greatly complicate the issue." The "non-compliant" user equipment may have software that doesn’t use all the information in the GPS navigation message or that assumes currently unused frames of the nav message may be exploited by receiver designers — only to discover that future upgrades of the system softwareimplemented by the GPS control segment will cause non-compliant equipment to malfunction. The effect of the anomaly on users is variable and application-specific, depending on such factors as single- or dual-frequency receivers, correlator spacing, type of correlator, thether local differential techniques are used, or phase-based or code-based application. Consequently, the U.S. Air Force has “no one-size-fits-all answer,” Lake said during the 90-minute presentation. Emphasizing the Air Force’s desire to gain greater participation by manufacturers of user equipment in sorting out the options for mitigating the effects of a signal anomaly, Lake said, "If you have made shortcuts or assumptions in [receiver] software development, we want to know who you are and what you’ve done," Lake said. "We really want to work with you." In a notice in the March 26 Federal Register, the U.S. Department of Transportation Research and Innovative Technology Administration (RITA) invited comment on the proposed options for improving SVN49’s performance. 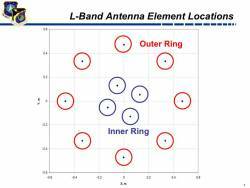 • Set SVN 49 healthy with the current 152-meter antenna phase center (APC) and associated clock offsets. • Set SVN 49 healthy with factory default APC and clock offset. • Users switch to multipath-resistant receivers to minimize adverse impact from SVN 49 signal. • Modify receiver software to use look-up table corrections to account for unique SVN 49 signal. • Increase SVN 49 user range accuracy (URA) minimum value to “3” by changing bits in the GPS data message that allow user equipment to de-weight or exclude SVN49 signals. • Remove data modulation from L2 P(Y)-code to mitigate impact on high precision users. • Change L2C PRN code to a ‘‘unique sequence’’ to prevent L2C users from including SVN 49 in their solutions. • Change SVN–49 from PRN01 to PRN32 to prevent updates to WAGE (military) users. • Use spare health code so future users could use SVN 49 despite unhealthy setting. Each option was developed with a specific user group and/or receiver type in mind and can be used with or without the other mitigations. All mitigations are intended for use with SVN 49 only, and no changes will be made regarding other GPS satellites. An informational briefing prepared by Col. David Goldstein, chief engineer at the GPS Wing, discusses the nine options in greater detail and may be downloaded as a PDF here. The PDF includes a template for comments that can be submitted to the docket (see accompanying figure). In soliciting feedback from equipment manufacturers and users, Lake emphasized that the set of options should not be considered as something that will be implemented a “complete package,” but rather individually or in a variety of combinations. Consequently, he said the Air Force “wants to know concerns for individual options, not any given combination,” and for the specific type of equipment that a company makes or a person uses. • Federal eRulemaking Portal: Go to <http://www.regulations.gov>. Follow the online instructions for submitting comments. • Mail: Docket Management Facility: U.S. Department of Transportation, 1200 New Jersey Avenue, SE., West Building Ground Floor, Room W12–140, Washington, DC 20590–0001. • Hand Delivery or Courier: West Building Ground Floor, Room W12–140, 1200 New Jersey Avenue, SE., Washington, DC, between 9 a.m. and 5 p.m. ET, Monday through Friday, except Federal holidays. A second GPS Wing teleconference to discuss the mitigation options is scheduled for 4 p.m. on April 30. The teleconference number is 1–800–366–7242; passcode: 6530000#. Karen Van Dyke, DoT/RITA’s acting director for positioning, navigation, and timing, emphasized that, although comments at the teleconferences will be recorded, these must be submitted in writing to the RITA docket in order to be considered officially. 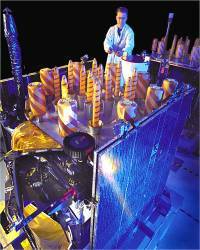 Launched March 24, 2009, SVN49 carries a special L5 demonstration payload that was added to a GPS Block IIR-M satellite when it appeared likely that the first Block IIF satellite would not be ready for launch in time to secure an International Telecommunications Union (ITU) allocation for the new safety-of-life signal. In addition to the L5 signal, GPS L1 and L2 signals travel through a 162-inch cable to a reserve auxiliary port on the spacecraft where it connects to the antenna array (or “farm”) that transmits the GPS signals. Those latter two signals are reflecting off the L5 filter at the port and traveling up and down the cable. These reflections cause a secondary-path signal with a delay of approximately 30 nanoseconds, resulting in a permanent multipath signal within the satellite. The multipath manifests itself as elevation angle–dependent pseudorange residuals (PRRs), increasing as SVN49 appears higher in the sky from the perspective of the user equipment. The satellite’s navigation message identifies the signal as “unhealthy” to alert users but receivers can process the signals. This anomaly is unique to SVN49, and Lake said that the Air Force has does not anticipate similar problems arising on the new-generation Block IIF and Block III spacecraft, which will implement the L5 signal differently. As a temporary fix, the Air Force adjusted the satellite’s time to offset the 30-nanosecond delay and the broadcast orbital ephemerides to make the antenna phase center (APC) appear as though it is 152 meters higher. This effectively reduces the maximum error seen by GPS reference station receivers from more than four meters to less than one meter, preventing measurements from disrupting normal control segment operations. 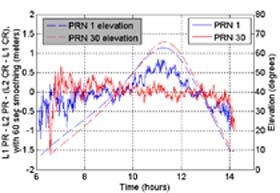 The PRRs do not become substantial until the satellite’s elevation angle reaches about 60 degrees, but even then the PRR is about the same as that on older Block IIA satellites still in operation. Moreover, because of the location of the orbital planes in the GPS constellation, most satellites are seen below that elevation. Indeed, these factors have led some to endorse Option 2, which would have set SVN49 to “healthy” status without attempting to mitigate the anomaly. Given the relative accuracy of consumer-grade single-frequency L1 C/A-code receivers, the SVN49 anomaly has little practical effect. So, the proposed mitigations really are aimed at more expensive and precise dual-frequency receivers that process both the signals’ codes and carrier phases. Some high-end receivers with advanced multipath-mitigation technology are not affected by SVN-49’s spurious signals, but others will not function at all. The signal distortion effects vary significantly depending on a receiver’s hardware and software design. These varying effects prevent a single solution for all forms of user equipment, according to the GPS Wing engineers. Option 4, for instance, would have receiver manufacturers implement software updates to add look-up tables to compensate for the elevation angle–dependent error for specific receiver types based on the frequencies/codes tracked, a receiver’s front-end bandwidth, correlator spacing (if using an early-late correlator), and correlator type (especially if not early-late correlator). Option 5, which would increase the user range accuracy (URA) index broadcast by the satellite to a value of “3” or higher to alert receivers to de-weight SVN-49 measurements. But many receivers ignore the URA index, which is considered unnecessary when differential corrections are available. In addition to feedback from industry and user communities worldwide, the Air Force will use the National Space-Based PNT Systems Engineering Forum (NPEF) and other meetings to gather feedback on mitigation options. The GPS Wing and 50th Space Wing at the GPS Master Control Station, Schriever Air Force Base, Colorado, hope to implement the SVN49 mitigation decision in June 2011. Noting that manufacturers and users may have to live with the decision for the next 20 years — given the performance of Block IIR satellites now on orbit, Lake said, “We don’t want to implement a solution and then discover there is a problem. We’ve done that before.” With 30 healthy satellites currently on orbit and another four "residual" satellites available for reactivation in the constellation, the Air Force is in no rush to reach its decision.